As the planes hit the World Trade Center on September 11, 2001, Aidan Delgado was in the process of enlisting in the U.S. Army Reserve. Two years later, he arrived in Iraq with the 320th Military Police Company. As he witnessed firsthand the brutality of the occupation and the abuse of unarmed Iraqis, Delgado came to believe that war was immoral and ran counter to his Buddhist principles. He turned in his weapon and began the long process of securing conscientious objector status. His book is urgent reading for anyone who cares about American ideals overseas, and for all those who understand why peace is patriotic. 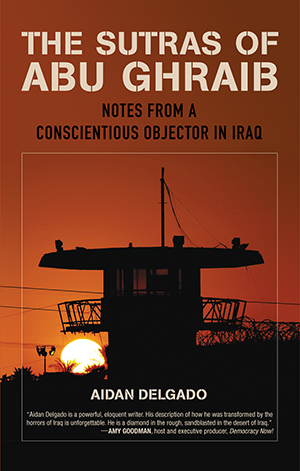 “Aidan Delgado is a powerful, eloquent writer. His description of how he was transformed by the horrors of Iraq is unforgettable. He is a diamond in the rough, sandblasted in the desert of Iraq.” —Amy Goodman, host and executive producer, Democracy Now!